A New York Times story raises the issue that we teaching college students discuss with the students — How much of your personal life should you be disclosing online? 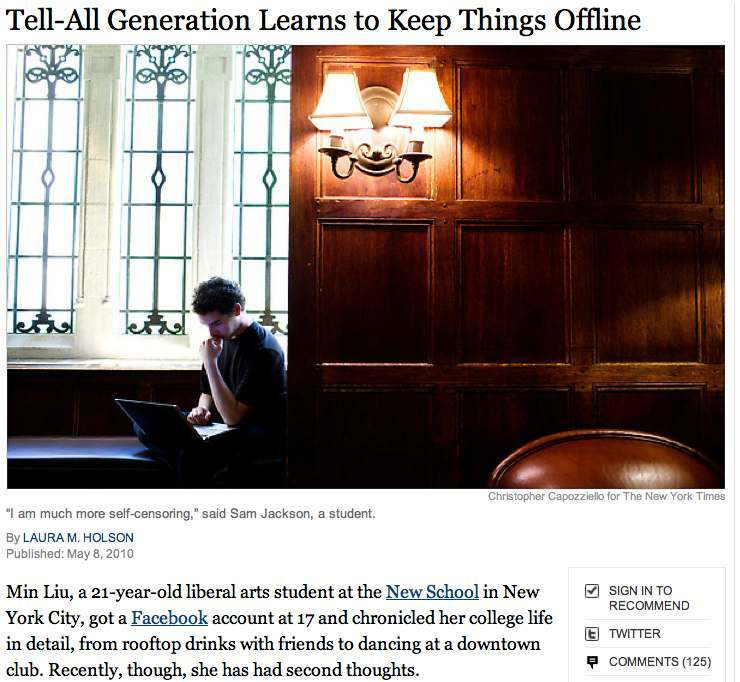 “The Tell-All Generation Learns to Keep Things Offline” starts with the story of Min Liu, a college student at the New School in New York City. She opened a Facebook account when she was 17 and now is concerned about what’s online about her because she now is applying for jobs. Photos showing her drinking, wearing a “tight dress” and attending a party she wasn’t invited to are some of her concerns about what’s on Facebook about her. Of course, all that information is clearly stated in The New York Times story, but, I guess, she doesn’t think too many future employers would be reading the story. The article discusses the importance of using privacy settings on Facebook and other social software. Liu has contacted people to take down those photos of her. Jackson can remove those early too-candid blog posts. In Writing for Mass Communication, we talk about one’s online self, and we do that early in the semester. The discussion ties in well with the assignment for students to write a resume and a cover letter for a media job they would like to apply to. From comments students make and facial expressions (wide-eyed shock, in some cases), we know that many of the students haven’t thought about photos of them and comments they’ve made on Facebook beyond how those are perceived by friends and family. Students tell us that after this class discussion they review their Facebook profile and delete information or reset the privacy settings. But a key point is trying to help everyone (as young people aren’t the only ones being perhaps too disclosing online) realize the necessity of self-monitoring and being aware that the online audience can be way beyond one’s circle of friends. Thinking before your post is a better strategy than trying to recapture the genie of digital information once it’s out of the bottle and online. Thanks for mentioning the Guerilla Marketing book! I was just planning to use this blog to market our publications and the entire journalism department at Tech High School both within our school, to parents and the surrounding community. It will take a bit of time but I believe it can pay bigger dividends in the long run.